Knarr is an Icelandic Maritime Consortium, consisting of six major technology solution providers building on decades of experience in the Icelandic Fishing Sector. All the members have a long and successful history in the local Icelandic Fishing Industry and have as such very strong ties to the core business on an international scale. Each one of the members of Knarr are in themselves strong entities that individually provide successful solutions to the Icelandic and the international seafood industry. As a team, we provide the client with a coherent solution and integrated vessels with the latest technology, that have proven successful both in our highly competitive home market as well as our international projects. Each of the six companies that form Knarr has the ability and industry network to pull in subcontractors and suppliers to enable a successful completion of large scale and versatile projects for the marine industry. The strong relationship between the companies within Knarr become a strong asset for our customers as we have worked together on several projects and built trust that lasts. This allow us to exchange industry secrets and detailed 3D drawings within the group ensuring complete alignment of the total design. A complete and aligned drawing package will ensure a smooth process for the shipyard and installation teams. For the clients, this will be a seamless teamwork that will ensure the best possible result of the final vessel. With the Icelandic fishing business run as a successful and profitable business that has not relied on any subsidies in the past 40 years, we know that efficiency is a key element to a successful operation. Brimrún was established in the year 1992 to become the National Distributor for Furuno in Iceland. As a Furuno company we provide first class navigational-, fish finding-, communications- and various other electrical equipment for ships, including safety and emergency equipment. Frost was established in 1993 with the merging of two companies which started operation in the early sixties, so Frost draws on decades of experience and know-how. Naust Marine has an impressive reference list of domestic and international ships that have the ATW system on board, as well as electrical winches designed and manufactured by Naust Marine. Nautic is the designer of the vessel and the master 3D model of the ship will be developed and coordinated by Nautic. The approach is to design from the keel, up to a finished ship, with the specific function of the ship in mind, at all times. Skaginn3X has more than 20 years’ experience in on-board solutions and fish processing systems and have played a major role in enabling the Icelandic fishing industry to increase export value. Skipatækni ehf. is a leading concern in Iceland within the fields of naval architecture and marine engineering. The company has played a part in the development of the Icelandic fishing fleet since the advent of stern trawling in Icelandic fisheries. The approach is to design from the keel, up to a finished ship, with the specific function of the ship in mind, at all times. The new fishing vessel on the horizon is using cutting edge technology and know-how in all aspects of its design. Not only does Nautic have skillsets in Naval Architecture and Marine Engineering, but many employees gain from hands-on experience from working onboard fishing vessels as well as working directly in shipbuilding at shipyards. Such experience is valuable when it comes to design work. The bodylines of the fishing vessels ensure that capacities are sufficient for all the installations and deadweights required by the customer. For example, our trawler concepts focus on specific ways to manage the position of the vessels waterline at all times, with highly variable conditions of the vessel during the fishing trips. Not only will this improve the vessel movements, but this is a contributing factor in reducing fuel consumption of the ship. 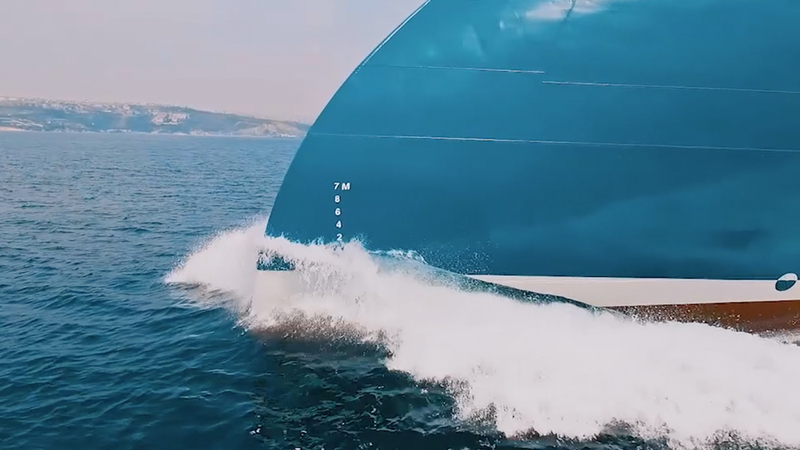 For obvious reasons the bow concept results in considerable energy savings when the vessel is ploughing through rough seas, since there is not fighting with the waves, as the laws of Archimedes are given the opportunity to apply physics in a proper manner and deal with the waves without any struggle. The buoyancy in the forward ship is built up more slow and gradually, allowing the waves to come upon the tip of the Enduro Bow, and slide effortlessly of the sides of the bow without any struggle. Focus on Processing Area and Hold Arrangement. In our mind the processing area in a processing vessel is a key area in the ship, where the raw material is converted into value. Accordingly, we have given this area special attention. The design allows for no structural pillars on the processing deck. The structural elements of the vessel are arranged in such way that no structural pillars will be needed to support deck structure above this key area. For this we have adapted special method of structuring our vessels, by using transverse web frame structure in combination with longitudinal local strengthening of deck. We are using deckhouse structures located on the decks above to assist us in obtaining sufficient strengthening and avoiding any possible vibration risks of the deck areas. We submit all our structural work to in-depth vibrational analysis. In our larger vessels, we strive to obtain about 3.0 Meter free ceiling height in the processing area. In our design, the hold areas are usually made up such that they serve as integral part of the processing arrangement, allowing for flexible use of each one of the holds in the vessel. We pay attention to central and spinal approach for centralized service of holds located both aft ward and forward of such central service lift arrangement.